The Observatory fact-checked Odeen’s tweet. 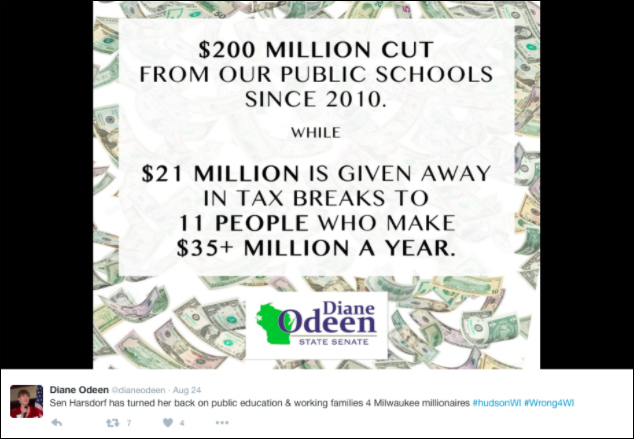 Odeen’s claim that $200 million has been cut from public schools is mostly false. Budgets from 2010-2016 show that state education funding increased. Odeen’s $200 milllion number comes from a memo that left out important factors such as decreased enrollment, property taxes and federal aid changes. When you look at all public school funding sources combined, as in this follow-up memo, education revenue increases by $20 million. Odeen’s claim that $21 million in tax breaks goes to 11 people making over $35 million is mostly true. Odeen accurately cites the number from this memo, but pulls it out of context, because over 4,500 other people who makes less than $100,000 also received the tax breaks. The Observatory was not able to tie either claim back to Sen. Harsdorf’s actions in the state capitol, so Odeen’s claim that Sen. Harsdorf has turned her back on public education is unobservable. 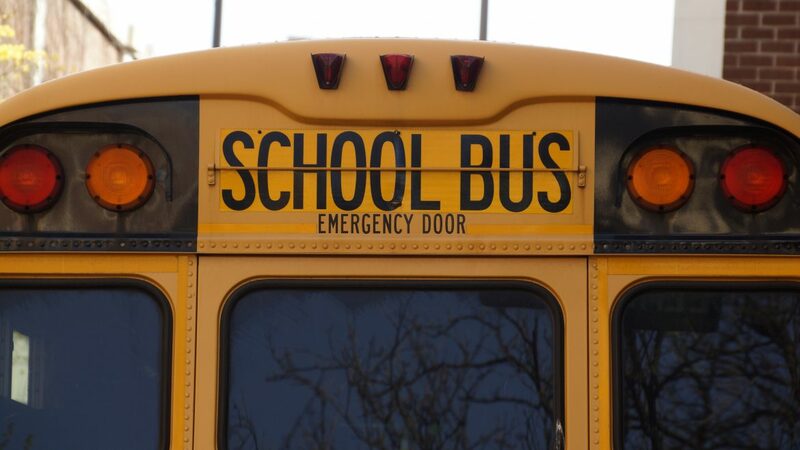 The Observatory reached out to Luck School District, part of State Senate District 10 in northeastern Wisconsin, to understand how candidates’ claims about education might affect the communities of their constituents. Chris Schultz, superintendent of the Luck School District, did not know for sure if cuts have been made to K-12 education since 2010, as he has only held the position for two years. But he guessed that any cuts around 2010 would be statewide cuts as a result of the recession. According to Schultz, state funding for K-12 education remains at the same level as in 2006. Schultz said instead of increasing their budgets, districts have sought thousands of dollars in operations referenda in addition to their budgeted funding. However, he also said that “categorical aid” for K-12 education actually increased by $100 per pupil this year. Schultz explained that overall spending and direction of spending on public schools are different issues, so the candidates can present the issue in very different frames. And while Schultz expressed disappointment in campaign rhetoric such as Odeen’s half-true tweet, he said that the issue of state education funding provides “significant opportunity for debate and contention” and hopes that the education issue will remain a priority throughout the election and the upcoming biennial budget. Read the Observatory’s fact-check of Odeen’s tweet. Legislative Fiscal Bureau. Memo re: Estimated Tax Year 2017 Individual Income Tax Distributional Table for Manufacture and Agriculture Tax Credit Claimants. June 28, 2016. Retrieved from Wisconsin Budget Project at http://www.wisconsinbudgetproject.org/wp-content/uploads/2016/06/2017-MAC-Distributional-Table.pdf/. Legislative Fiscal Bureau. Memo re: General School Aid Changes, 2010-11 to 2015-16. Aug. 12, 2016. Retrieved from http://legis.wisconsin.gov/senate/democrats/media/1116/lfb-memo-re-general-school-aid-changes-81116.pdf. Legislative Fiscal Bureau. Memo re: School District Revenue by Fund Source. Aug. 17, 2016. Retrieved from http://legis.wisconsin.gov/senate/05/vukmir/media/1083/fiscal-bureau-memo-august-17-2016.pdf. Schultz, Chris. Email re: WCIJ Observatory Interview Request. Sept. 30, 2016.